Bruce Dalby grew up in Utah in a musical family. His father was a prominent music educator, and Bruce started the footsteps-following process by taking up the trumpet at age seven. All nine children in the family played instruments, and Bruce was one of three to become a music teacher. After his undergrad work at Utah State University, Bruce spent five years as a band director in Caldwell, Idaho. That was followed by a master's degree at the University of Illinois, then five more years as band director at Manzano High School in Albuquerque. After another graduate degree at Illinois, Bruce was fortunate to be able to return to the Land of Enchantment in 1989 as a professor in the Department of Music at the University of New Mexico. 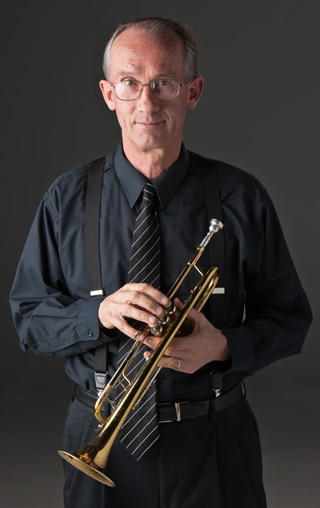 His activities at UNM have been varied, including six years as director of the jazz program. His main responsibilities, however, are in music teacher preparation. He considers teaching music itself plenty challenging, but to presume to teach how to teach is especially audacious. Still, he tries. Bruce's trumpet playing experience is wide ranging. Learning to read music notation early in life can pay wonderful dividends, including giving white boys from Utah the opportunity to play jazz and salsa in addition to the standard "classical" fare. He considers himself lucky to be able to gig on the side, and will likely continue as long as the phone rings and the lips buzz. Other interests include active outdoor pursuits such as bicycling and hiking. The plan is for these activities to continue well past the point where most of his peers have retired to the TV room easy chair.